Benguerna, M. & Mangone, E. (Eds) (2016), Beyond the Borders. The Mediterrranean between Cultures, Migrations and Life-world. Fisciano: ICSR Mediterannean Knowledge. D’Angelo, G. & Martins Ribeiro, J. (Eds) (2016), Borders and Conflicts in the Mediterranean Basin. Fisciano: ICSR Mediterannean Knowledge. Gardelle L., Benguerna M. (dir) (2015). Les enjeux de la formation des elites maghrebines en France. Formation, identité, mobilité des ingénieurs dans un monde globalisé. Paris : Editions Publisud. Mangone E. (2015). 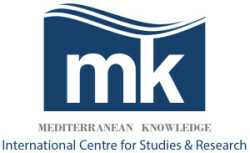 Mediterranean Knowledge for the Future of Europe. Cava dei Tirreni: Areablu Edizioni. Mangone E., Masullo G. (ed)(2015). L’Altro da Sé. Ri-comporre le differenze. Milano: FrancoAngeli.